We(Gale Maroney and I) had a great trip again. Like most years, the Elk stayed in Colorado. We don't measure the success of the trip by the tags we use, but on the hunting experience we have. On the 3rd or 4th day of the hunt, I was watching over a narrow clear cut slope as the sun came up. (this is where I flashed my pan(flint lock rifle)) on a 5X5 bull 2 years ago) at 0655 that morning, having watched a mule deer doe for about 5 minutes, then seeing the legs of an Elk thorough the bushes across the clear cut, I proceeded to get quite excited. About that time I hear some cow talk coming from behind me and down the slope a ways. With seeing Elk, and hearing cow talk, I figured life couldn't get any better than this. I am waiting for several minutes, My elk calls are all back at the cabin on wolf lake, well used by the Grand Children. But there is plenty of cow talk going on anyway. As i glassed the opposite side of the clear cut for sign of the animal I got the glimpse of, and struggling with how long to wait before its time to get after the thing, out comes a 5X5 Bull Elk. Now this is what my tag is for. Its standing there about 100 yards away facing me. No shot from this angle. I am pleading with it to come forward, or to turn and give me a better angle. Course he is interested in this cow talk behind me. The anticipation is getting greater by the minute, strike that, Second!. All the sudden he turns, and I have the sights on him, from a prone firing position, and I fire! He didn't just turn sideways, he turned 180, and I don't believe my ignition was perfect (Flint Lock-fuse action). Well he did another turn and ran down slope. Thinking, this is good. (wounded animals will tend to go down hill) I am stuffing a new charge into the muzzle, and watching where he is going, Over the ridge he goes, As I search for sign of blood, I look to the ridge behind me, and there are 2 hunters working their way up-hill. They are my cow talk. I approached them and asked if they saw the bull i shot at. They had. They believed it was uninjured. As they had a view from above. (I still spent the next 2 hours retracing the event). They were hunters from St. Paul, and we hadn't met before, and we didn't know of each others presence on this clear cut slope. They had been working there way up and had seen the Bull, and 3 others (a 3 point and spike, along with a cow) This is what started them to cow talk. I was sitting in the tall grass already. I apologize to them for the coincidence of us being in the same place, and told them that it was too bad they didn't get a crack at any of them. The next morning I am back at the same place, well before sun-rise. About 5 minuets before legal shooting here comes one of the hunters. He stops 120 yards in front of me and sits down. I whistle to him and wave my orange cap at him, he waves back to me, but stays put. I am now in a situation. So i walk over and ask the man, How am I suppose to shoot with you sitting in front of me. He said there is lots of places to shoot, and I don’t own the woods. I assured him he was correct, and I didn't own the woods, and told him its not right to take up a stand in front of me. His answer was, "Its not right to shoot at an animal his son was calling in". I was speech-less, I had no way of knowing anyone was around yesterday . So I moved to another place well away from Him, and still feel bad that they would think I was wrong in taking the shot i took. That they pushed me away, means nothing, that was their action. What bothers me is, they will know doubt tell the story about the hunter that spoiled their hunt. That bothers me!. Wednesday and Thursday we had some weather. It was what we were hoping for. It takes a change in weather to move the animals some times, As it was hot most of the time. We had lightning and snow both days, but only for a couple of hours each time. We had lightning on top of lightning for about 15 min. There was sometimes more than 35 bolts a min. Never have I been in a storm like that. Most bolts were across the sky, but many came all the way to the ground (we were at 9,600 feet). Thursday Smiley got some bugling action and got a look at a nice Bull. (he had a cow tag) I was watching over a wallow about 300 feet below him. I spotted an Elk coming down a slope about 300 yards west of my position. Checking my watch, I have about 25 min. until sun-down. 1835hrs 6:35pm. There wasn't time for me to wait and see where he was going, I had to go to him. After crawling under several downed trees, I made my way to the rock wall that divided the basin I was hunting. (this is where Anton Shook a shot loose at a spike bull 2 years earlier (Buck fever so bad he couldn't hold the rifle still). The Elk was about 150 yards out, but I was unable to see it well. I took out my monocular, and tried to find it, I couldn't see anything in it. it was still there when I put my glasses back on, but still it was not positioned to get a look at the head. Again I tried the Monocular, again it was useless, Then i discovered why. Why I was "shaaakkkkkinggg" like I was hypothermic, I couldn't stop the shakes, I have seen alcoholics shake as the bring a drink to their lips, but I was shaking worse. It just wouldn't stop. Then he trotted into the open, There it was! Antons Spike Bull, I was shaking just like Anton did 2 years earlier. The bull trotted off into the trees, and I stood there shaking. 5 min., later as I tried to determine why (i was still shacking), I realized what had happened. As i was making the rapid stalk, I overdosed on adrenaline, and didn't work off all the adrenalin before stopping to check for the Elk. There is no way for the body to burn off adrenalin when you stand still. The old Buck Fever syndrome . The next few days were again hot, and we saw no more Elk, But it wasn't uneventful. Saturday Morning as I sat over the big wallow, I saw a movement, Here comes a cub bear! He is a small little rascal, and passes by me at about 30 ft, and disappears. I don't see anything or hear anything. Now where is Mama? The cub was too small to be on his own, he is going into the den with mama this fall. "Where do I go"? I don't know. I sit tight. Smiley is about 150 yards away watching the upper slope. We plan on talking at 11am. 1hr.10min from now. I am big time concerned about where Mama is, My thumb is on the cocking piece, of my Cap lock rifle(I changed guns after the miss). My eyes are everywhere. Its very disturbing thinking about where she might be. Finally 11am. Smiley comes on the radio. Did you have a visitor? Yes I answer, where is it? and did you see Mama? Smiley didn't see Mama, but he did see the cub cross the basin and into the trees on the far side. Where was Mama? we cam only speculate. The nights were just above freezing, and the days were for the most part too hot, Most hunters reported they didn’t see anything, some got animals (they had some hard work to do). As we packed our gear out. 3.4 mile back to the trail head. more than 1,000 feet back down. we reminisced about the hunt. It would have been a lot of work had we got a kill. we had a good time, I will anguish about the other hunters if they want to blame me for the circumstances that placed us at the same place. The anticipation of the hunt makes it easy to drive 1,200 miles straight through stopping only for the outrageously high priced fuel and some fast food. Once we are contently in the area we are going to hunt do we take the time to have a nice sit down breakfast. After picking final items necessary for 8 days of hunting camp life we drive to the trail head. Now it has rained continuously during this trip and its still raining in the high country. As we assemble the gear we are going to pack 1,000 ft. uphill and 3.5mile we keep getting rained on. The thought of spending the night in a wet camp the night before opener sends chills up ones spine! 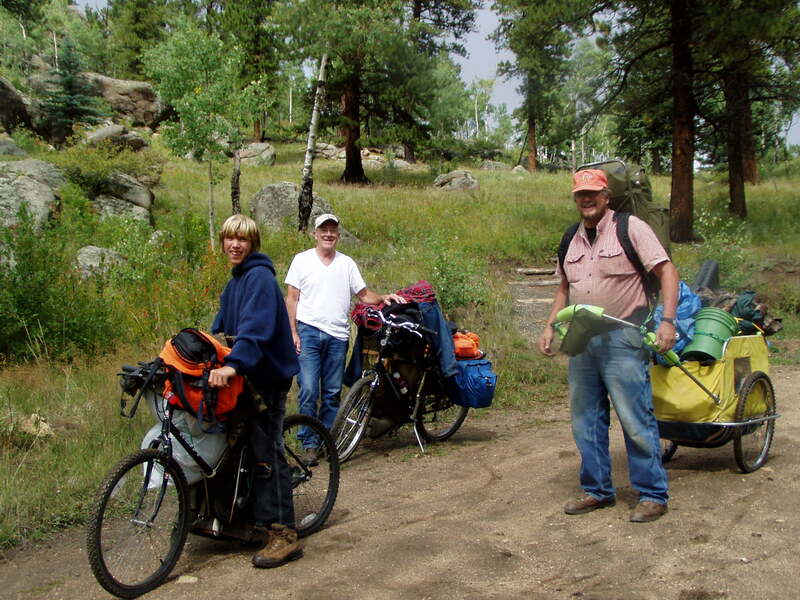 There was a break in the clouds and we make a charge up the mountain, Jared and Gale pushing bicycles with frame packs strapped opposite them, and I am the Mule I have that miserable cart that Smiley(Gale) was so excited about using the last 2 hunting trips. Even Anton cursed the thing 2 years ago as it did its best to try and remove his boots while pulling it uphill. BUT, I changed all that, I put bigger wheels on it and a long draw bar that is shock-corded to my frame pack. 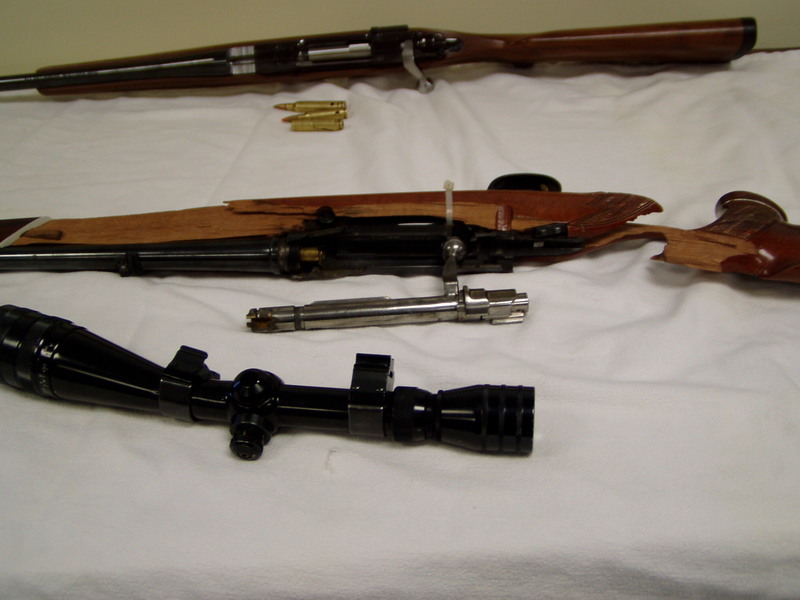 It is loaded to the point of toppling over(check out the pictures below). Jared was playing football for the Chisholm Jr. High school the afternoon of our departure and thought he was in shape. Well that 14year old Knucklehead was going to find out what work is. 3 hours later with tongues dragging (Jared's had dirt on it) We arrive at our favorite camp sight. This was a stressful situation, worrying about our, "OUR" campsite being vacant the night before opener. We had always arrived a day early, or more in past years but with Jared and school, we were on a short schedule. As we setup camp the rain came again, The Lord was with us, of that we have no doubt! We got everything covered and tied down and set for the early AM in record time. Jared was feeling the effects of the long uphill walk and the elevation . I had to dump him out of his sleeping bag and he struggled to get things together that morning. Smiley left camp 30 min. before Jared and I as he was going into the big wallow 1/2 mile above camp. Jared and I were going 1/2 way up the slope to where I missed the 5X5 2 years earlier. We didn't get that spot, There was someone already watching over that part of the slope, Dad-burn it anyway, Lost out the 1st morning. I am right away thinking of the interaction I had with the other hunters 2 years ago and the 1st thing that comes to mind is, will they even know that we are not going to interfere with their hunt. We drop back down a few hundred feet and find a break in the side hill to get away from them. 20 minutes into the 1st morning, the other party gets shooting! "What the HEY"! We could of had that spot, We just didn't get out of camp early enough. When we heard the others talking we announced ourselves and came in to take a look-see at what they got. It was a Rag-Horn 3 pointer. Still had a lot of velvet hanging from the antlers. But a nice healthy animal, "Jared's 1st bull", had we gotten an earlier start. Smiley said they weren't there when he went by 30 minuets ahead of us! "That's Hunting". Jared was still dragging this morning, but the thought of someone else getting his spot again helped get him going. We got the bloody spot, as the other hunters packed out that day. They were from New York State, and they said "the city" didn't even belong in their State, anyway the slope was all ours now, gut pile and all. Jared had a cow and calf bed down in front of him later that afternoon. Smiley made his way up top to Steve's kill sight. 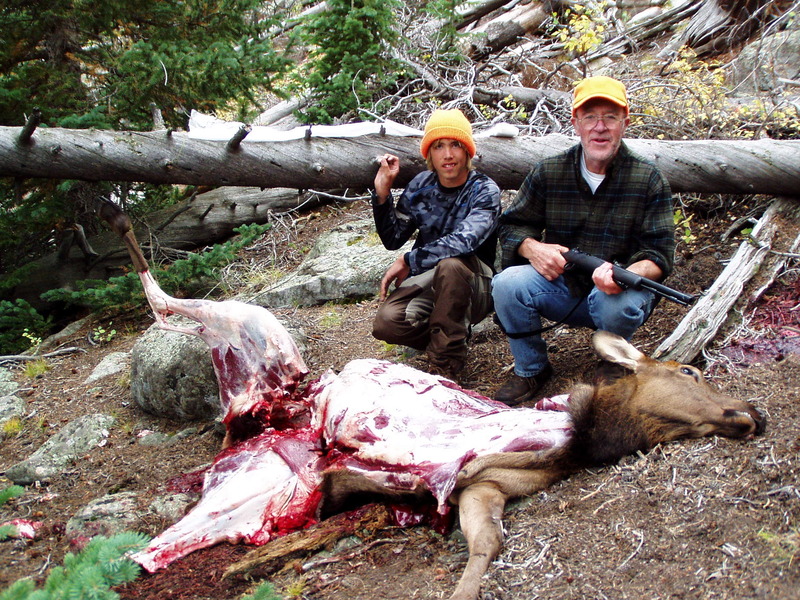 Steve was the wonderful bow hunter we ran into back in 1998 when we 1st hunted this area. We were locked out of the area we had planned to hunt and didn't know what we were going to do until Steve came out of the woods and we learned from him why the gates were locked and he went on to show us on his maps where we might hunt. He even left his maps with us with marks for all the past kills he and his father made over the years. What a blessing running into Steve Jackson. 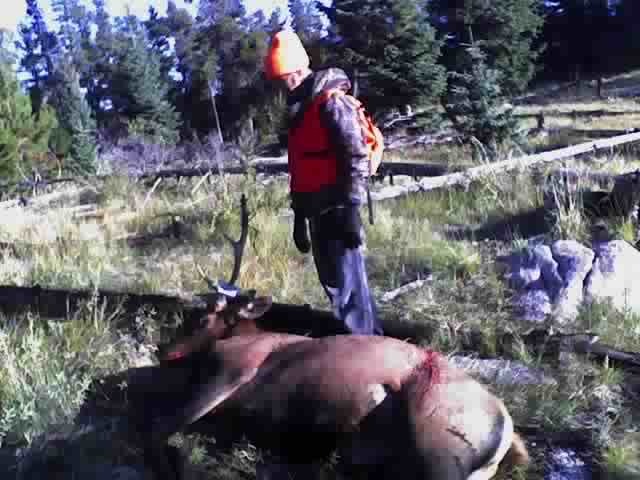 Steve took a 5X5 bull that season and we were able to help him pack it out. What a wonderful feeling it was to help out a man that helped us so much. 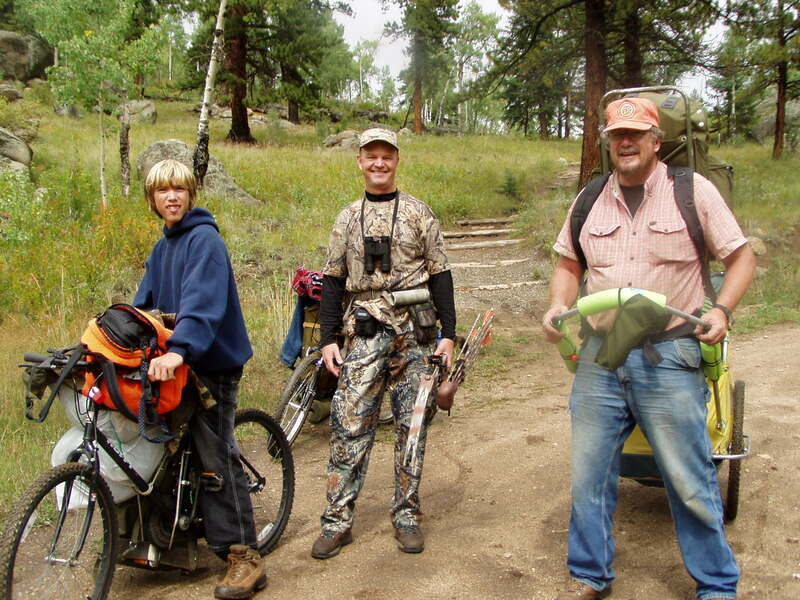 We had e-mailed with Steve a few times over the years, and Would you believe it Steve was hunting here again this year. We had a nice visit and promised to keep in touch again. What a Wonderful Lord we have that brings such great people into our lives! Jared was up to full power now. There was no holding him back. He waited on us on our uphill walks now. It was nice to see him feeling more at home in the mountains. Jared wanted to check out a meadow we skirted below camp. He saw all the churned up dirt from all the summer Elk activity. He was POSITIVE there would be a bull waiting for him around that meadow. I gave him free sailing that morning. He was to range out 1/2 hour and return back to my position. We did that all morning and finished up the day on the slope above camp seeing nothing. Jared knew where he wanted to go this morning and I had other plans, Smiley decided it was time to hike up to the saddle where he and Steve took Elk in the past. I told him to unload his Jack Handle(what I call an "In-Line muzzle loader) as soon as he got up there and that he could load again as soon as he came back down. Of course he didn't listen to me and got a poke at a cow late this morning. I got the "Good" news when we connected with our radio's at noon. I had to go get Jared off the slope and we made our way 800 feet up to where Smiley was waiting. We looked all afternoon and couldn't find more than a few spots of blood and no discernible trail to follow after it stopped running. Nothing but dry duff. On the way down I pointed out to Smiley the spot that I finally saw a grouse the day before, and Jared had also stated he saw a grouse earlier the day before. Of course I thought he was telling Jared tales, as I had hunted this area 6 times in the last 12 years and that was the 1st grouse I had ever seen and he tells about seeing one on the 3rd day?? ?, But as it turns out the grouse he saw was in the same area I saw mine yesterday. the Turd had made the rounds that 3rd afternoon! He probably covered more ground that afternoon than I cover in 3 days! Smiley hit one but we can't find it. That is a bad feeling for all of us. Smiley heads back up to the saddle again, Jared & I start the day on the slope. I am 1 mile East of him and can see him in my looking glass but he cannot see me. I have a view of the Moon as it sets over Rogers Peak one of the close peak to Mount Evens. Both are snow covered and from my angle its a site to behold. Jared can't see over the crest of the slope he is sitting on because of the timber. We headed for the wallow for the afternoon. Now we hunt all day, there is no going back to camp until just before dark and the days are long this time of the year. Jared has been a real trooper, and is enjoying every minuet of this hunt. We spend the afternoon covering the wallow and as usual, I want to get into camp while we still have light to get things ready for the next day, but more importantly, I like to end the hunting day before it gets to late to find a well hit Elk if we were to be so lucky. We start our hike out of the bowl the wallow is in, and go maybe 50 yards and a nice bull, I say 4X4 is running down the slope 80-90 yards ahead of us broad side. Jared is more than ready, He is 15 ft. to my left and about 10 paces ahead of me and the Jack Handle he is carrying roars. Then he is off, running in the direction of the bull and another one is taking flight, Its even bigger, Jared says, as I don't even see it, I am trying to determine where the 4X4 is going. Then Jared remembers, He stops and reloads, then he is off again. I find the churned up dirt, and start my marking and trailing. Jared is like a steel nut in a pinball machine, he's here, he's there, he's everywhere. That bull heads right out on the trail we were taking and crosses the slope within 50 yards of the gut pile. No blood. Thank God he isn't wounded! Jared is wound tighter than a jump rope in the lawn mower. Its going to be a long night. What an experience, Being right there when he gets shooting at a nice Bull his 1st year Elk Hunting! We have to hunt that same area again today. Jared thinks this is the best hunting spot on the face of the Earth, and so do I. I have missed one 6X6 bull, Flashed my pan on another 6X6, saw 2 other bulls, 3 cows 1 calf, Anton shook his rifle at a bull there 2 years ago. Why wouldn't I think its the best hunting spot on Earth? Well its not long and that old Coot unloads his Jack Handle again. We connect on the radio's, and he tells me he need packs and packer's. Well Green Bay isn't my favorite team, but I and Jared are all we can muster, so we are Packers today. Well its the cow he wounded 2 days ago. He came across it bedded down and dropped it as soon as it got up. He had hit it low in the front leg. Nice Cow. Like the last time the old Coot shot one up there we get it de-boned and packed down (to camp) just before dark. We make our plans for the next day as we dine on Campbell's chunky soup for us and spaghetti-O's for Jared. We will hunt, Jared & I for a couple hours the next AM and then pack out. Smiley starts to break camp as we head up the slope this last morning of the hunt. Jared is suffering from a low grade anxiety, as this hunt is coming to a close. I jump an Elk just after Jared & I split up. This is the 1st Elk I jump other than the bulls with Jared. Its just a warm feeling to be here. One doesn't need to fill the pack to have a wonderful time! Jared is stalling as I head back to camp to find Smiley without a smile! He tells about finding the meat sack with the back loins in it empty! NO!, It can't be! Not the Loins!. Sure enough some thieving critter robbed us of all the loins last night. We didn't have enough propane left to leave the lantern by the meat sacks like we did in the past. Jared and Smiley used it up warming up wash water down at the creek. What a wast! The trip down is quick, and this was the 1st year we didn't come down during the hunt. We had Jared along to help bring everything we could possibly need the 1st time. This was the 1st year hunting that we didn't have any snow. Not one time and in years past we had rain or snow every night. mostly snow. And this year was the 1st time the ELK had been in the wallows before we started hunting, and they never returned to any wallow during the 7 days we hunted. This will puzzle me to know end. In the past there was never any activity in the Walliw's until the last couple of days of muzzle loader season if even then.